The move is done, we’re settling in, and we finally have internet! It’s been a while since I’ve moved and I forgot how much is involved. And over the years, especially after getting married, you really seem to accumulate a lot of stuff! And a lot of kitchen stuff, if you’re me. 🙂 So now it’s time to celebrate! And what better way than with some whoopie pies! To make the cakes: Preheat the oven to 350 degrees F. Line baking sheets with parchment paper; set aside. In a medium bowl, whisk together the flour, cocoa powder, baking powder, baking soda, and salt; set aside. In a large mixing bowl, cream the butter and sugar on medium speed until light and fluffy, about 3 minutes. Add the egg and vanilla, beating well to fully incorporate. With the mixer on low speed, add some of the flour mixture, then some of the buttermilk; alternately add the flour mixture and buttermilk and mix until the batter is just combined and smooth. Scoop heaping tablespoons of batter onto the prepared baking sheets, leaving 2 inches between each cake. Use slightly moistened fingertips to gently smooth and shape the cakes, if needed. Bake 8 to 10 minutes, or until the cakes are firm to the touch. Remove the baking sheets to wire racks, letting the cakes cool completely on the sheets. To make the filling: In a large mixing bowl, combine butter, powdered sugar, and marshmallow cream; beat on high speed until smooth and fluffy; stir in the vanilla. To assemble whoopie pies: Match up cakes in pairs by size. Spread filling onto the flat side of one cake of each pair. To make clean edges with the filling, transfer the filling to a piping bag and pipe a small amount one cake of each pair. Sandwich the cookies together, and press the filling to the edges. Serve immediately or wrap individually in plastic wrap and store at room temperature. these whoopie pies look amazing! my kids would love them! My mother made these for our snacks at school. We eventually got tired of them but at first they were wonderful because we almost never got sweets. The whoopie pie (along with blueberry pie) is the state dessert of Maine. My mother used to make them the size of salad plates when I was growing up there. 🙂 Due to the cold and being outside a lot, everyone just wore the calories off. Sadly, that doesn’t happen any more so I make mine human sized. Yes moving has a way of letting you know just how much “stuff” you have. Glad you have gotten settled in. 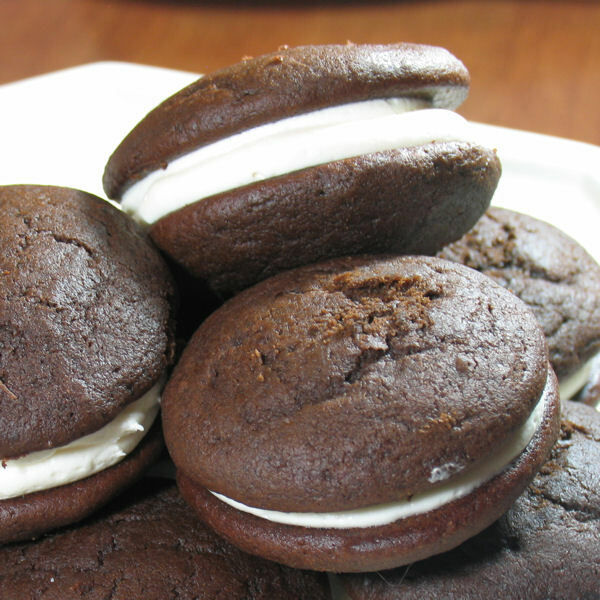 Your whoopie pies really do remind me of why this is such a favorite and has continued to be a classic. The rich fluffy chocolate cakes with the creamy marshmallow are really hard to beat. Also, they do have a way of taking oneself back to childhood days. Delicious post! 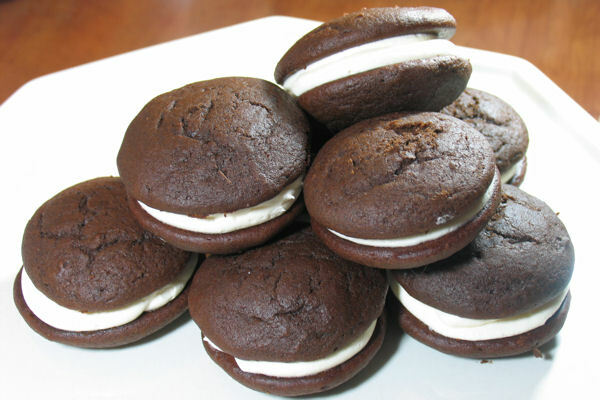 These whoopie pie look divine! Love marshmallow cream filling. I have never had any whoopies in my life, but these look particularly appetising. The marshmallow cream you have used for the filling sounds also very unusual for me. Yay for being moved it! And a great way to celebrate! Oh my goodness! These are gorgeous! You must be very settled if you took the time to make these:] I hate moving! too good! Way too good! Love me some whoopie pies! Your whoopie pies look perfect! Congratulations on the move! It’s a lot of work to move, but I actually enjoy it because I can organize everything from scratch… maybe not so much anymore because I accumulated way too much stuff. Thanks for sharing these delicious whoopie pies!